Mandeville Center for Dental Excellence is a state-of-the-art facility offering advanced diagnostics and several levels of sedation dentistry—including IV sedation. Dr. Charles Schof is a highly trained and skilled expert specializing in cosmetic, reconstructive dentistry and dental implants. Dr. Schof and his team treat the most complex reconstructive cases, all of which the team completes in office. 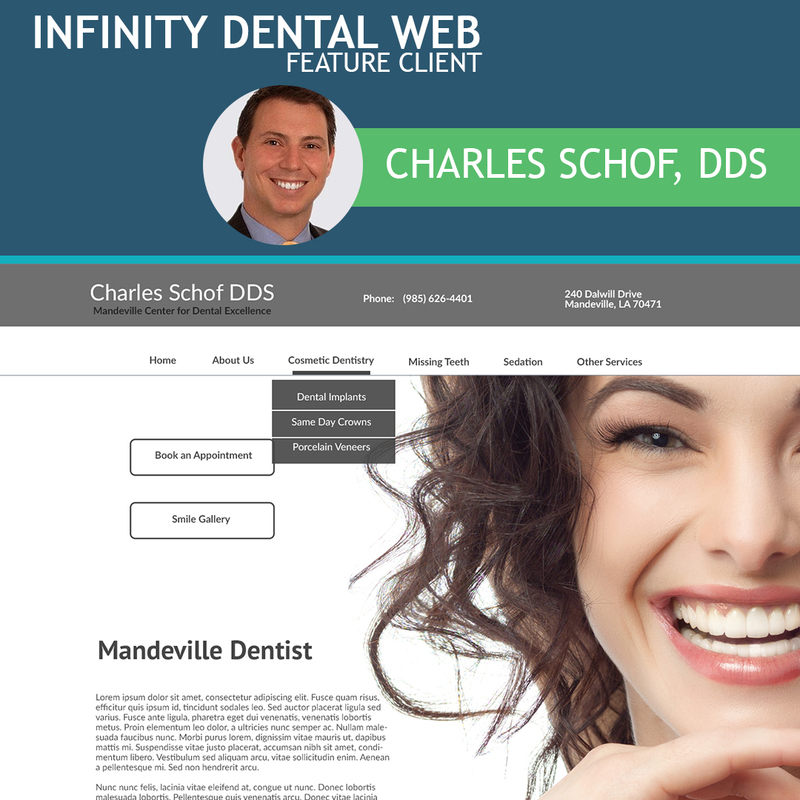 Dr. Schof’s high profile website features a sleek, modern design. When developing the design, we selected a warm gray with pops of color to portray sophistication, while subtly hinting at Dr. Schof’s affinity for cutting-edge technology and the highest standards of cleanliness. The calls to action are user friendly without being aggressive in order to convey a professional image without the suggestion of desperate, over-eagerness. SEO blogs and website copy features custom content written to highlight more than 40 keywords and phrases that complement Dr. Schof’s overall brand strategy and drives visitors to his website. Dr. Schof’s dedicated social media community manager creates and curates custom content, engaging his target audience and increasing his reach on a variety of social networks including Facebook and Twitter.